When dogs become nervous or unsure of other dogs, people or other triggers; they will show various stress relieving behaviors. Some of these behaviors may include: turning their head or whole body away from the trigger, licking their lips or flicking their tongue, increased frequency of eye blinks, increased facial wrinkles, stiff body posture, leaning toward or away from the trigger, increased ratio of breaths or cessation of breathing, whale’s eye where one sees the whites of the dog’s eyes as he/she tries to look at two places at once, tucking their tail between their legs or raising their tail high, having their hair stand on it’s end, and wagging of the tail. To decide if your dog is stressed, it is important to view each of these behaviors as part of the dogs’ total body posture and not isolated to a single behavior. To view each behavior separate from the others takes too long to determine if the dog is stressed and might lead to a wrong assumption. For example, people commonly think a “wagging tail” means the dog is friendly. Instead, it actually means “arousal”. This arousal could be a good or a bad thing. Dogs are excited when they approach something they want to visit or investigate but they are also aroused when they are fearful and ready to bite another dog or person. Take a look at the included video and see for yourself of an aroused dog who is wagging his tail. However, his arousal is not friendly arousal. He is a fearful dog who becomes reactive when the distance to another dog is decreased past his comfort level. If you were the owner of this dog standing behind him, you might have incorrectly assumed your dog was being friendly because the tail was wagging. However, as this video points out, a wagging tail does not mean friendly behavior. It simply means high arousal which could be a good thing or in this case a bad thing. So how can one identify stress behaviors and use them to their advantage so that the distance between dogs can be increased before an unfortunate incident happens? Rather than isolating behaviors and trying to play detective to decide if it means good or bad, the answer is to observe your dog’s behavior when he/she is completely calm and relaxed. Become keenly aware of how your dog carries itself when relaxed; how tight are it’s body muscles held, how many facial wrinkles are there, are the ears usually carried forward or back, how is the tail carried (low, medium or high), etc. This way when you are out in public and your dog reacts to a trigger, you’ll immediately will know your dog is stressed without trying to play detective. You will instinctively know your dog is stressed and it may give you the needed time to be proactive instead of reactive and increase the distance of your dog from the trigger. 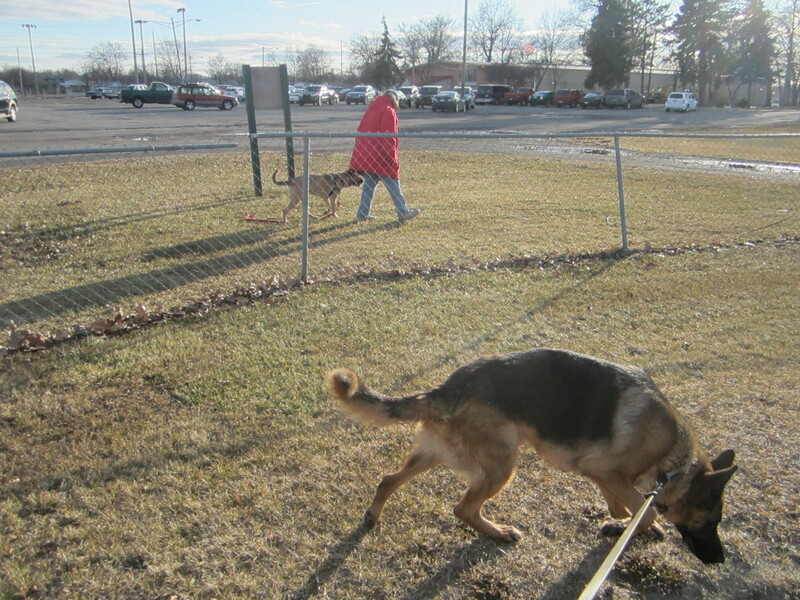 To learn more about dog behavior or to obtain personal training with your reactive dog, contact the Michigan Dog Trainer. This entry was posted in Aggression, Dog Bite Prevention, Dog Training Tips, Uncategorized and tagged aggression, dog aggression, dog behavior, Michigan Dog Trainer, Michigan Dog Training, tail wagging. Bookmark the permalink.